Confinement Herbal Bath and Red Dates Tea Inclusive. Confinement herbal package is designed to condition and nurse mother’s reproductive system and health after childbirth in Singapore. The 28 days confinement herbal package includes pre packed confinement herbs for daily tonic soup, red dates tea and bath. Confinement herbal bath and red dates tea are highly recommended, must have items for your confinement herbs list. 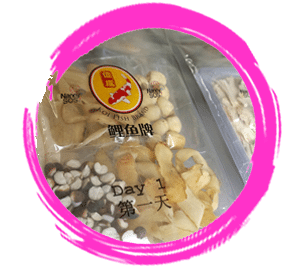 As TCM herbs are conveniently packed into 28 packets for each day’s confinement soup, there is less preparation work for confinement nanny or family. Simply follow the soup menu and cooking instructions catered in the TCM herbal package when preparing confinement meals. No longer need to fret about soup recipes, the amount of herbs required or the need to buy more herbs as the problem of running out of herbs is greatly minimized. 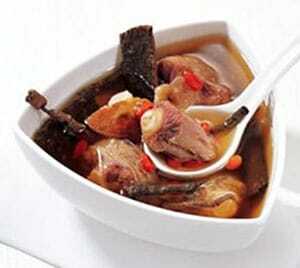 Why Confinement Herbs Soup and Drinks are Important? Confinement drink and herbal soup helps to replenish water loss as breastfeeding drains energy, leaving mum tired, dehydrated and thirsty. The herbal soup not only balance Yin Yang and restore Qi but makes it easier for the bodies to absorb the needed nutrition compared to solid food as well. How TCM Herbs Can Help? During postpartum period, there are four different stages which the soup is specially formulated to meet the nutrient requirements of the mother. According to Traditional Chinese Medical (TCM) studies and review, confinement diet should be adjusted at each stage to restore her health during the confinement month. Nutritious confinement food is essential as a woman is at her weakest after childbirth which her body is easily susceptible to cold and chill. Instead of water, it is recommended for mothers to drink red date tea, dried longan tea or roasted rice tea. Drinking too much plain water during post natal can affect metabolism, cause water retention, visceroptosis, which may lead to rheumatism, neuralgia and other women’s diseases in the future. It can be harmful for her overall well being and health if there is no proper post natal or medical care after labour with healthy diet to nurse and restore a mother’s uterus back to its original size. By having proper nourishment from nutritious confinement soup and chinese herbs, the confinement package provides the best natural remedies for mothers to recuperate back to their pink of health. Pre packed confinement herbs for 28 days with cooking instructions. Confinement herbal bath for 28 days. Red dates tea for 28 days. Delivery fees is applicable for standalone purchase of confinement herbs package. Delivery fees is waived if reserved with confinement nanny services. Delivery only applicable within Singapore mainland. Surcharge applicable for Sentosa and CBD areas. Basic list of confinement herbs to buy for DIY post natal care. 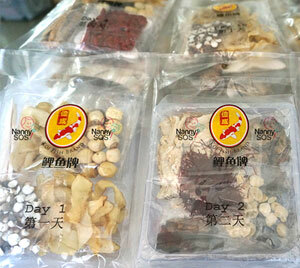 The 28 Days Confinement Herbal Package will include all other necessary chinese herbs pre packed into convenient packets. The confinement herbs list as listed below is not complete but are commonly used to make confinement soup or drinks. Red Dates (Hong Zao, 红枣). Health benefits of nourishing the blood, replenish vital energy, regulate menstruation and boost immune system. Improves Qi, boosts blood circulation and calms the spirit. Used to make red dates tea by boiling with water. Black Date (Hei Zao, 黑枣). Benefits of tonifying spleen and stomach. Used to boil with water for making tea. Black date is rich in nutrients, contains protein, fat, carbohydrates, vitamins, calcium and iron. Du Zhong (Eucommia Bark, 杜仲). Health benefits include nourishing the liver and kidneys, strengthen muscles and bones and stabilise pregnancy. Also calms the spirit, alleviates pain, promotes diuresis, prevents inflammation and improve immune system. Bei Qi or Huang Qi (Astragalus, 北芪). Health benefits of nourishing the spleen, promote urination, relieve water retention, helps to retard aging and enhance immune system. Dang Shen (Codonopsis Root, 党参). Benefits of replenishing vital energy, relieve fatigue, promote blood production and nourish blood. Dried Longan (Long Yan Gan, 龙眼肉). Health benefits of replenishing blood, nourishing heart and spleen, improve complexion and well being. Beneficial to the digestive system and mind. Chinese Wolfberry (Qi Zi, 杞子). Benefits of improving eyesight, strengthen immune system, nourish liver and kidney and activate blood circulation. 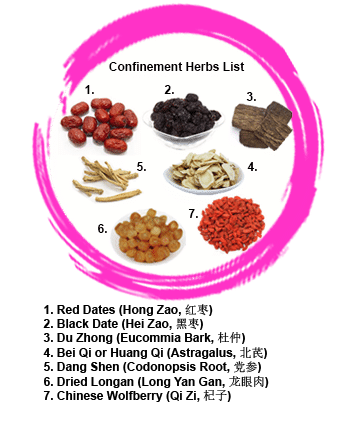 The best place in Singapore to buy Chinese herbs for your confinement soup can be from Bugis, TCM clinic, Chinese medical centre, confinement nanny agencies or online estore. Budget and quality of confinement herbs are often a concern to most families. 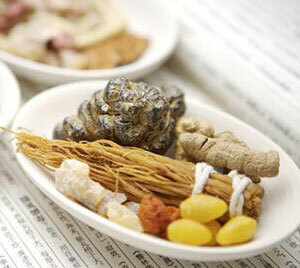 It is not necessary to buy expensive herbs such as cordyceps or ginseng. There are cheaper herbs as replacement for the same purpose. Provides convenience as confinement herbs are pre packed. Confinement herbs list provides a standard confinement soup menu to follow. Dosage or quantity of herbs is measured correctly and packed accordingly. Less wastage of unused herbs compared to big packets of herbs which you may not know how much is needed. Easy to follow given instructions to cook even without help of confinement nanny. Reserve 28 Days Herbal Package For Confinement Today! FREE Delivery During Office Hour! IMPORTANT: Please Keep Refrigerated to Maintain Freshness of Herbs!